Our highly trained staff provides quality, cost-effective and timely services for any kind of fiber optic instruments such as Optical Spectrum Analyzers, Agilent Omniber and 86120 wavelength meter. We are compliant with many of the requirement of ISO 17025 and accreditation is being pursued. AssetRelay in close integration with its parent company, SImbol, has advanced repair capabilities throughout the electrical and fiber optics test and measurement equipment spectrum. We have developed unique repair capabilities that most calibration centers and even repair labs cannot provide. At a fraction of an OEM (Original Equipment Manufacturers) repair price, we can many times even repair equipment that OEM wouldn’t touch or would quote for a complete overhaul when only a few components need replacement. 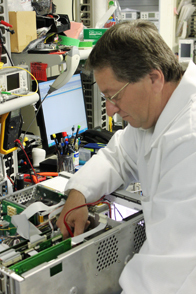 After years of experience in the used test equipment sales through AssetRelay, Simbol's technicians have become experts in repairing virtually every type and brand of test and measurement equipment. Our repair and calibration facility occupies 2000 square feet / 200 square meters and is stocked with first class calibration equipment. Send us your defective electrical and optical equipment for an evaluation at a low flat fee. Once completed, you will receive our diagnostic and recommendations. Assuming that the equipment is worth repairing, you will get a Repair Quote. We will wait for your acceptance or rejection before initiating any further action. Your important equipment is defective, should you either have it repaired or should you buy another one instead? Send us your defective equipment for evaluation. Following the diagnostic and the recommendations if you decide not to have it repaired, we will apply the cost of the evaluation as a credit towards the purchase of the same model or similar model from AssetRelay inventory. We might be able to make you an offer for your defective equipment.